But then I tried them. I've never really used many pale/sheer shades. The main reason is streakiness. I hate it when you apply a polish and you can see streaks. I got NO streaks with these polishes. NONE. 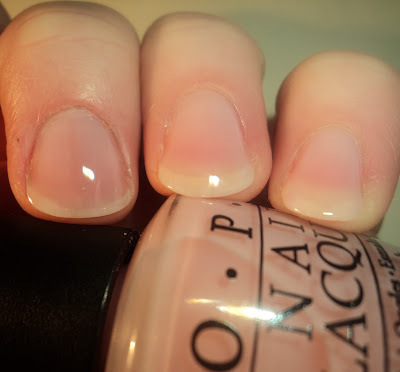 In fact, I've always thought that sheer/thin = streaky, but these polishes proved me wrong. I think these are very pretty polishes and they do serve a purpose in the polish market as not everyone can, or wants to wear, bright blue holo. Two of these can be worn semi-opaque if you so desire (I'll point those out in the review). I did 3 coats on all colors, except I Juggle... Men, which is two. In the Spot-Light Pink - Milky, pink sheer. In the bottle, this one looks like it would be the deepest in tone, however, when you put it on, it's very sheer. In fact, I don't think there is a way to get this polish opaque. It's that sheer. That said, this is a gorgeous polish. It looks great at just one coat for a clean nail look. If would also look nice with a french manicure. The formula is nice, and it's actually thick for the polish being so sheer. I had no problems with application and I think this may be my favorite of the bunch (check my head). So Many Clowns... So Little Time - Milky, off-white semi-sheer. I love the color on this one. It's definitely an off-white, but there's also a faint whisper of pink. Like I mentioned above, I did 3 coats on this one, but it looked very nice at one coat, for just a simple wash of color. As you can tell, I was able to get this one semi-opaque in three coats, though can see a bit of pink coming through from my nail bed, as well as VNLs. Also, I love the name. It's my twenties all wrapped up in polish form. :P LOL. Step Right Up! - Milky, shell pink creme. This one was the most opaque of the bunch. It's a lovely pale pink, and like So Many Clowns... So Little Time, this looked nice at simply one coat, though I did 3 in the picture. The finish on this one was really nice. It had the squishiness of a jelly... almost like OPI's new Sorbet finish... only in super pale pink. I Juggle... Men - Purple and blue, microshimmer in a clear base. This one reminded me of the Nubar glitter/shimmer topcoats we've been seeing of late. It's a thicker clear base, with very fine, micro-shimmer suspended in the base. It's hard to see the colors on my nails, but you can definitely see the sparkle in the bottle. 2 coats. All in all, I really like these. I know lately, I've been sporting a lot of naked nails because I just don't want to deal with the hassle. These would be great to do as a simple, one-coat manicure for a little bit of color, when I'm in a hurry or polished-out. These are available now at e-tailers. I'd love to see I Juggle Men as a topcoat, maybe over So Many Clowns.